Harvest Kitchen & Bar will be serving breakfast, lunch, dinner and bar fare menu items built around fresh, seasonal, locally grown produce and local meat and dairy products. The Harvest concept of â��Farm Fresh to the Table\" allows us the opportunity to utilize local vendors while incorporating the freshest ingredients in season. 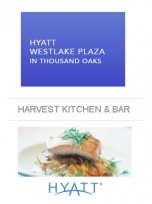 Hyatt Westlake Plaza will bring together the Hyatt\'s Food, Thoughtfully Sourced and Carefully Served.\' Menus will change seasonally.